World Travel on 2, motorcycle friendly campgrounds and much more. Welcome to the City of Crossville! We are located atop the beautiful Cumberland Plateau on Interstate 40, only a short drive to three metropolitan cities. Our 2,000 foot elevation offers a mild, four season climate year round. Our rural area offers an abundance of outdoor possibilities, with mountainous wildlife reserves, lakes, streams, and the Cumberland Mountain State Park. We are known as the Golf Capital of Tennessee. With nine pristine courses in our community, Crossville has become a golfers' paradise of national recognition; however, the opportunities and activities are endless. Our Cumberland County Playhouse serves more than 165,000 visitors annually and the historic Palace Theatre on Main Street is always active. We are also the location of the United States Chess Federation headquarters, a restored railroad Depot & Caboose Visitor's Center, and part of the World's Largest Yard Sale on Highway 127 North. The Crossville Tennessee KOA offers you much more than just a place to stop. For non RVers we also have log cabin cottages and a 4-unit upscale suite, log lodge motel/suite accommodations We home a Homestead Home and apartment here - a great place for Family Reunions.. For those that use satellite, we have open sky. We have nice areas with trees for tents. At this time we do not have any RV spaces with shade trees. Looking for a place to play golf, Crossville is the golf capital of Tennessee. Great hiking, biking, canoeing, etc. are all nearby. Call for all the great area attractions. Crossville KOA is located just off of I-40 between two exits, so it's super easy off and on with no back-tracking to head either way. Whether going to or from Nashville 100-miles away or Knoxville 60-miles away, we have easy freeway access. Chattanooga is approximately 75 miles south of the Cumberland, that magic triangle that blends woods and waters of numerous national and state parks with a quality vacation environment atop one of the coolest places some 2000 feet above sea-level on the Cumberland Plateau. A hiking trail runs around the back of our property, and we are very pet friendly. Ride2Guide.com brings motorcyclist together with Roads 2 Ride, historic Towns to visit, motorcycle friendly dining, shopping, lodging, Cool Products, Vintage Cycles, Custom Cycles, Motorcycle Dealerships,World Travel on 2, motorcycle friendly campgrounds and much more. © 2019 Ride2Guide.com. All Rights Reserved. 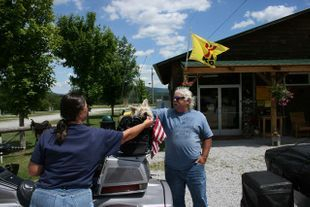 motorcycle friendly restaurants, motorcycle friendly campgrounds, motorcycle friendly lodges. motorcycle friendly shops.